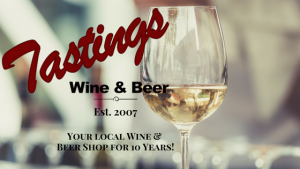 Your local wine & craft beer shop for 10 years! At Tastings, we pride ourselves on bringing our customers great wine & craft beer. We carry a diverse array of wine and a wide variety of craft beer from around the world. Each month we host tastings in our shop so that you can try our new offerings and maybe find a new favorite. Be sure to check out our Calendar page and join us for a free tasting. You can also follow us on Facebook for announcements on new arrivals and promotions. Is your business or non-profit looking to create a unique event that includes wine or beer? Stop in to see us and learn about our event packages. We’d love to be your partner for wine and beer tasting events! Contact Kristin@tastingswine.com for more information, or call the shop: 336-243-7220. Let us take the worry out of choosing and planning for wine and beer for your wedding! Make your wedding consultation appointment today!